This press release made it to us through the great folks at Alligator Records – and we are happy to spread the word about this upcoming show! 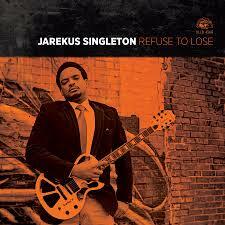 Musical trailblazer Jarekus Singleton, touring in support of his Alligator Records debut, Refuse To Lose, will give a free performance at the Aaron Bessant Park Amphitheater in Panama City Beach on Thursday, August 6, 2015. Singleton melds his original contemporary and traditional blues with hip-hop wordplay, rock energy and R&B grooves, turning audiences of all ages into devoted fans. With his untamed guitar licks and strong, soulful voice effortlessly moving from ferocious and funky to slow and steamy to smoking hot, Singleton is a fresh, electrifying bluesman with a bold vision for the future of the blues. Springing from the same Mississippi soil as Charley Patton, Muddy Waters and B.B. King, 30-year-old Jarekus Singleton’s cutting-edge sound – equally rooted in blues, rock and rap traditions – is all his own. Refuse To Lose and Jarekus’ live performances feature a scintillating guitar attack and lyrically startling original songs, all sung with a natural storyteller’s voice. With songs telling real life, streetwise (sometimes funny) stories brimming with surprising images, pop culture references, infectious rhythms and unexpected musical twists, Jarekus Singleton unleashes a new wave of blues for a new generation of fans. This entry was posted on July 31, 2015 by 850music in Posts and tagged press release.